starting with Koda’s trip to Petco. As soon as we were through the door, she spotted the ferrets and immediately went into her instinctive frozen point position… I think she thought they were squirrels! Then she proceeded to chase them around their cage until I thought we would get thrown out. Poor ferrets! I’ve also been eating out a bit more than usual, but focusing on making healthy choices. 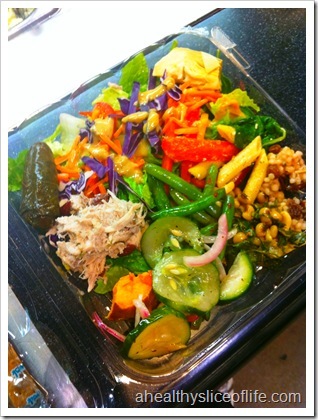 I happened to be in Charlotte the other day and treated myself to my old favorite… Earth Fare Salad Bar… the best salad bar in Charlotte. So sad I don’t live close anymore, but it’s probably better for my wallet. 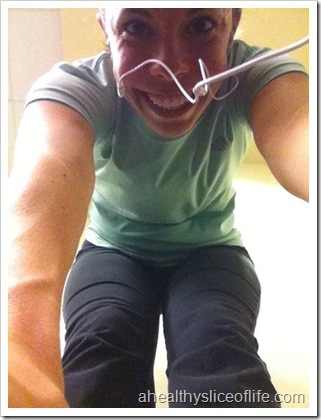 I’ve also been sticking to my new workout plan– wahoo! 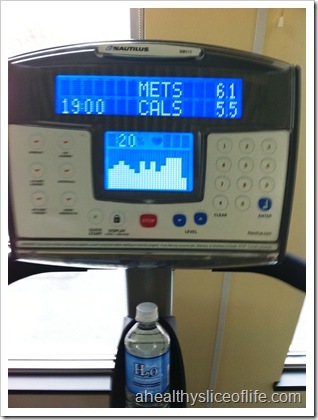 Monday I tackled the stair stepper and elliptical. Man that stair stepper sent my heart rate FLYING. I felt like I was stepping so slow, but loved it (and hated it all at once). I’m so thankful for that suggestion! Yesterday I conquered yoga and it felt so good. I don’t know why I stayed away so long. 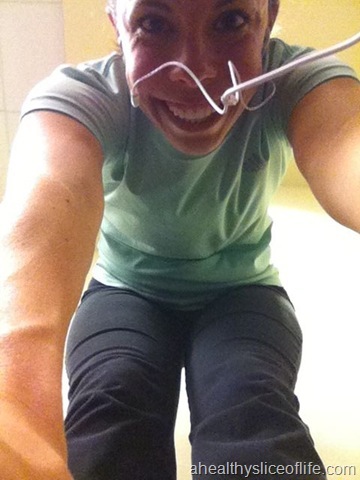 I can actually feel my muscles aching today and am excited to have it back in my routine. And, of course, I’ve done lots of stretching! And this morning… I made an AMAZING breakfast. I used my (now somewhat stale) sourdough and created some incredible French toast (pictured by using my not-so-fabulous iPhone camera). Notice the bananas? 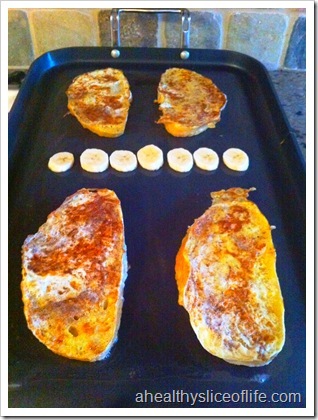 I’m not the first to come up with the idea, but I BEG you, next time you make French toast, grill up some bananas along side it. You won’t regret it. Even Hubbs wanted more grilled bananas! Served with a side of (nitrite free!) bacon makes for a fancy-feeling weekday breakfast! Now I’m off to conquer this day, and if you can’t tell, I’m feeling GOOD. My business is growing and I’m loving helping all these wonderful new people! 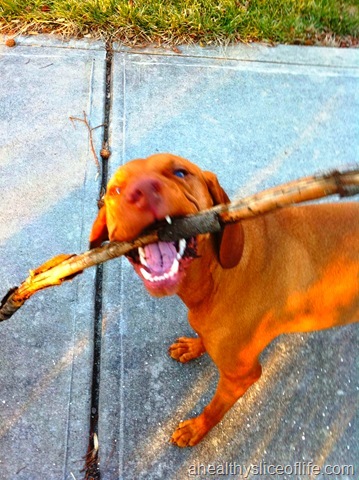 Today is going to be a GREAT day… even Koda thinks so because there are fresh sticks to be chewed! That salad bar looks delicious!! And good for you for getting your step on! 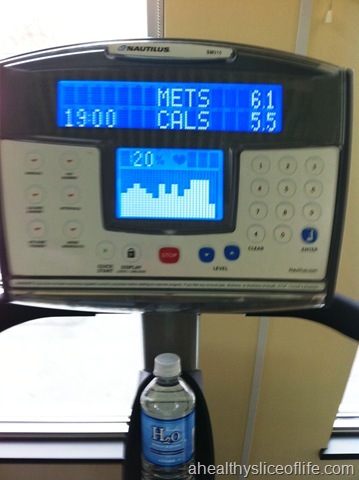 I am learning to embrace the elliptical until my leg feels better. I love salad bars!! Earth Fare and Whole Foods definitely have the best around here. So glad that you are feeling good! It sounds like you have lots of greatness going on and so exciting to hear that your business is growing! 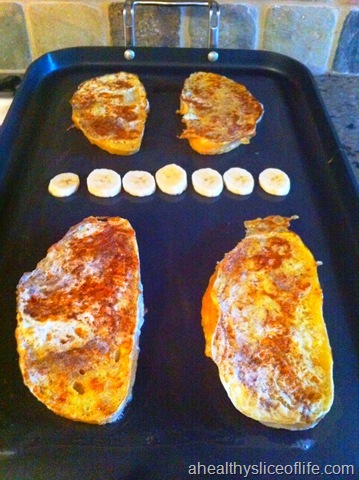 And I’ve never even thought to throw some bananas on the griddle! Genius! The stair stepper / stepmill always gets me so good! Wow, you can feel the positive energy flowing out of you into your blog. I think I’ll go do a “wog”, inspired by you! 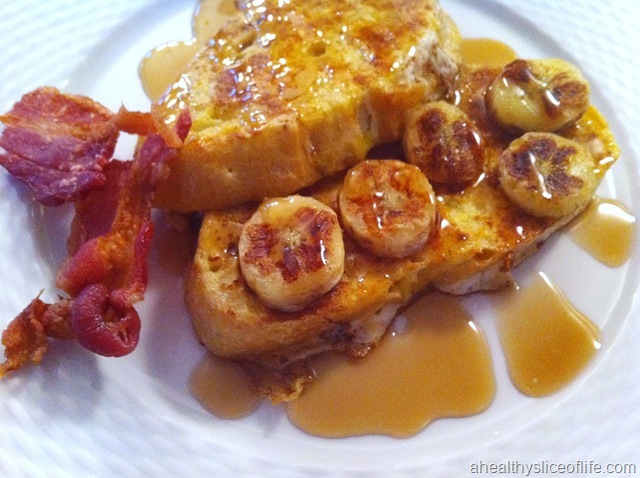 that french toast looks HEAVENLY. I need to try grilling up bananas on the side ASAP! 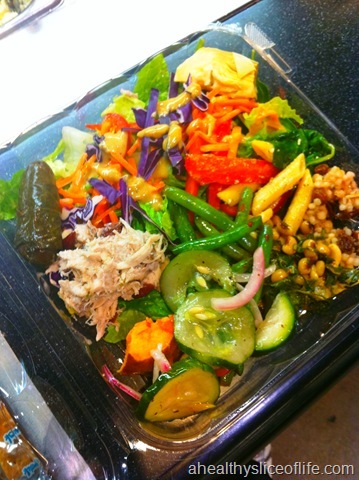 Salad Bar = Yumminess! And so does the french toast. the salad bar is making me drool! and i totally just ate! Hahaha, Koda is so cute! Your french toast looks delicious. I can honestly say I don’t think I’ve ever tried sourdough bread for french toast. that french toast looks awesome! I was really wanting to make french toast this morning but we didn’t have power! 🙁 Your Koda is super cute!!! Oh my stars – I want that french toast! That looks delicious! 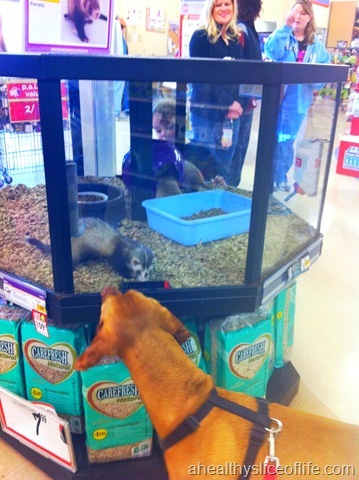 And I’m cracking up at Koda chasing those ferrets! She is too cute! Mmm…I LOVE grilled bananas! That looks like one awesome breakfast! 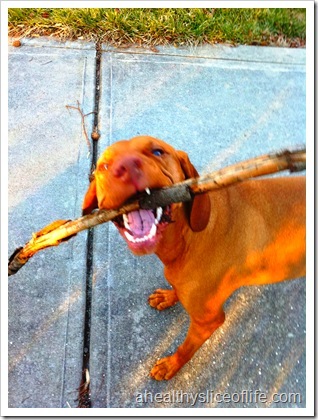 Congrats on sticking with your exercise routine…I promise I’ll send you that weight workout soon! Oh Koda!!! What a cutie! 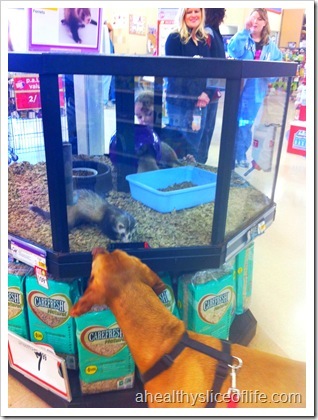 Though I’m not sure if the ferrets would agree!! So glad it was a great day, for you both. PS: grilled bananas. YUM!!!! 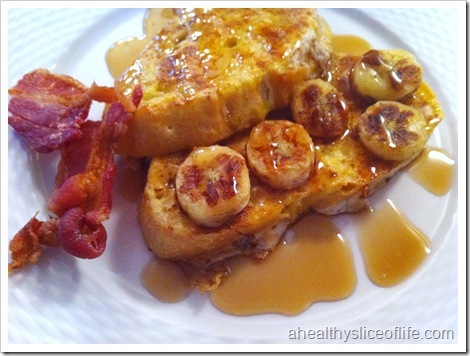 your french toast is to DIE FOR! !